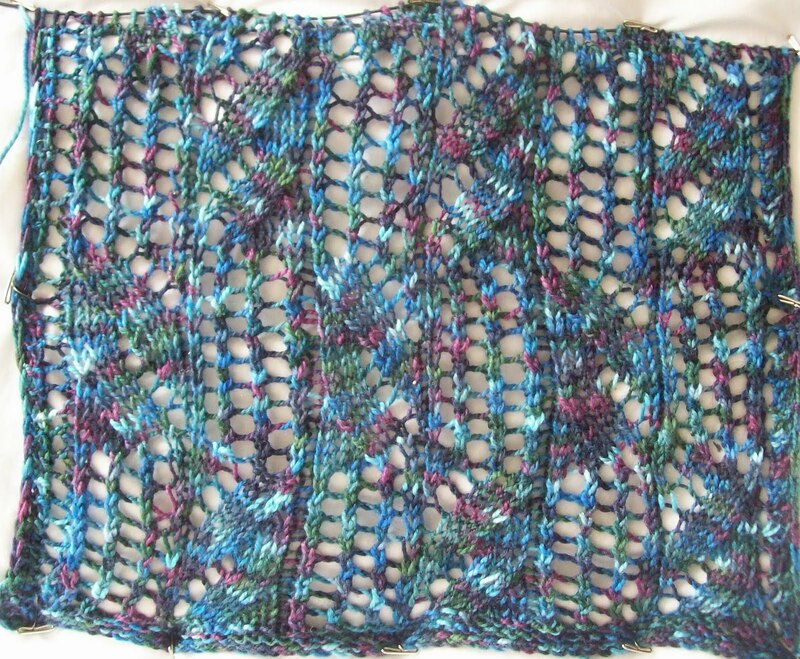 One advantage I have is I am a combo knitter, and long (LONG,!) ago learned to knit as you golf (I don't actually golf myself) I play it as it lays. --or in knitting language, I work the stitch as it presents. If the leading leg is in the front, I work the stitch by going into the front. If the leading leg is in the back, I work the stitch by going into the back. Its normal for me, when working ribbing or seed, or basket or any combination of knits and purls to have some of my stitches mounted leading leg in front, and others leading leg in back. This is because I do a combo purl and wrap my purls “eastern” so on the next row, they look are mounted with leading leg in back. 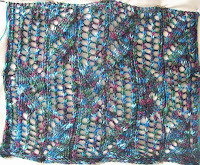 With stocking knit (all knits or all purls in a row (or round) all the stitches are mounted reversed. But with ribbing, the Purls of R1 are the reverse mounted Knits in R2. But the Knits in R1, are western/european (standard, if you will) Purls on R2. 2 by 2 ribbing is a series of leading leg front, and leading leg back \\//\\//\\//\\//\\. This lace has 4 parts—left leaning leaf, faggoting (8 rows) then Faggotting and right leaning leaf. In one part the together's are all K2tog's in the other part all the together's are SSK's. Another pattern repeat, and then a break, and off to my socks(still waiting for something more than a cuff!) I 'm loving this yarn.. It's a Smiley's bargain—Filatura Lanarota Fashion Toes sock yarn—I have 3 skeins-(for this scarf) at $3.50 a skein—enough for a nice sized scarf –for less than $10! but for right now, you can, if you want, purchase the pattern for Sally Lunn, from yesterday's post. I've knit very few scarves, mostly because I can't face the endless sameness. Love Sally Lunn! 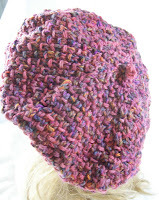 The variation possibilities are endless - what a great hat!